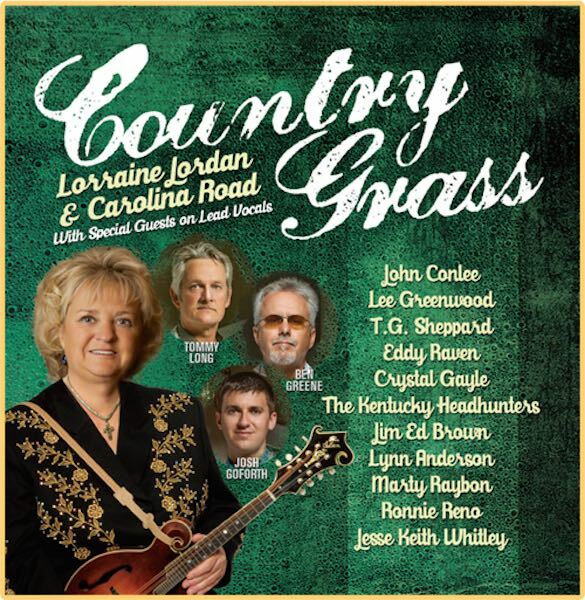 Lorraine Jordan & Carolina Road’s brand new album, Country Grass, has debuted at #6 on the Billboard Bluegrass Albums chart. The award-winning Bluegrass group teamed up with some of Country music’s top acts including Crystal Gayle, Lee Greenwood, Lynn Anderson, The Kentucky Headhunters, T.G. Sheppard, Eddy Raven, John Conlee, Marty Raybon and the late Jim Ed Brown, on what would become his final recording. The album was also the highest ranking debut on the chart for the week. Country Grass is fuelled by the lead single, ” Runnin’ Water,” which is a collaboration with Grammy award-winning band, The Kentucky Headhunters. The song recently debuted at #25 on Bluegrass Unlimited’s National Survey. The video for the song was shot on-site where The Kentucky Headhunters have recorded the majority of their top videos. Lorraine Jordan & Carolina Road started off 2015 on a high note, taking home three awards at the 42nd Annual SPBGMA (The Society for the Preservation of Bluegrass Music of America) Convention & Awards Show earlier this year. With Lorraine receiving top honors as “Female Vocalist of the Year,” Ben Greene winning “Banjo Player of the Year,” and the group collectively taking home “Song of the Year,” the group has established themselves as one of the top acts in the genre. Fans of traditional country and bluegrass will certainly appreciate Country Grass – Roughstock. This project showcases great voices, great musicianship, and great songs; songs that are so engrained in us as is, that re-imagining them the way that Jordan and her group have done is worthy of a standing ovation. In an era today where the roots seem too often be forgotten, Country Grass is a perfect look back that reminds us where country music came from – One Stop Country. There’s a lot more to be said for this album, but I think I can sum things up a simple observation; if you prefer your country without the cowboy hats and rhinestones, and your bluegrass traditional, then this is a fine place to start – Hudson Valley Bluegrass Association.